For my February Technique Night classes, my theme is intricate dies and the Big Shot Die Brush. 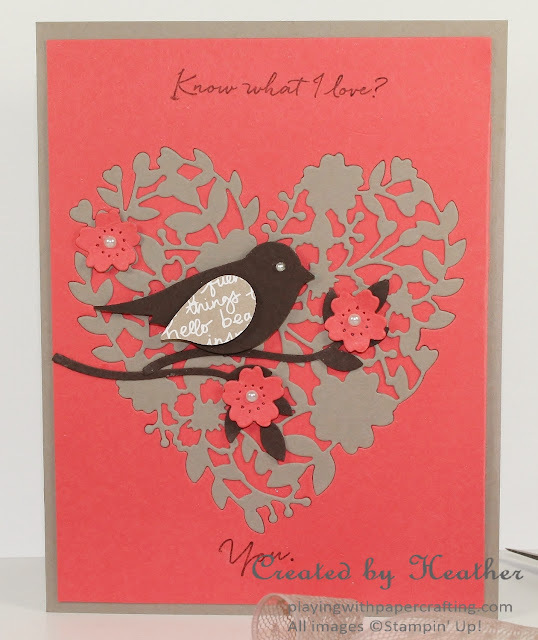 One of the cards we will be doing features the beautiful Bloomin' Hearts Thinlit Die embedded in the upper layer of the card front. It was inspired by a card that I found on Pinterest, which I basically recreated using Stampin' Up! products. I die cut two of the Bloomin' Hearts with the thinlit using the Precision Base Plate, one heart from the Watermelon Wonder cardstock and one from Tip Top Taupe cardstock. 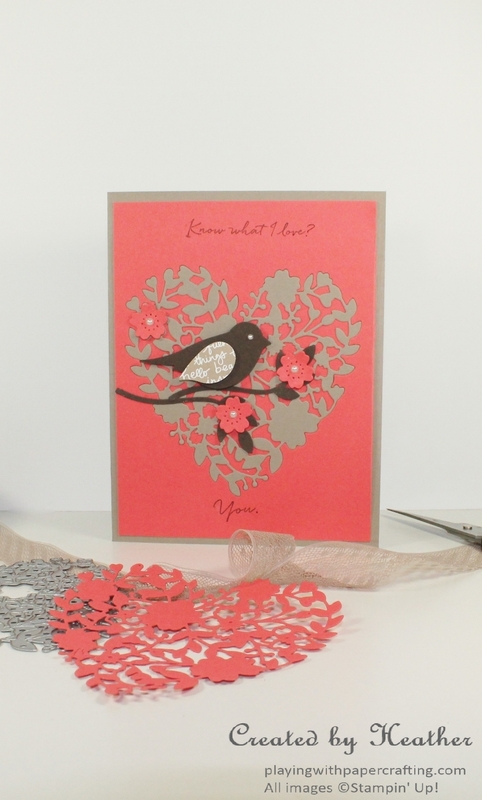 I then used the Big Shot Die Brush to remove the hearts from the die and to also remove all the little bits of paper from the die cut. I put the Watermelon Wonder heart aside to use for something else, and inserted the Tip Top Taupe heart into the negative space left by the Watermelon heart. No, I didn't fit all those little bits of paper back into the spaces in the Tip Top Taupe heart! That would be a ridiculous amount of work. I simply glued the top panel over a 3 7/8" x 4 1/2" piece of Watermelon Wonder cardstock, which was adhered to the card base where the heart would sit. The effect is the same though and it's really hard to tell that it's not all embedded. The sentiments are from the Sale-A-Bration set What I Love. You can earn this set for free for a $60 or more order during Sale-A-Bration, until March 31st. A word of caution, though. Definitely stamp the sentiment first before you die cut the heart out of the cardstock. If you mess up you can turn the paper over or stamp another one before you die cut. The branches and bird are made with the Bird Builder Punch, an old favourite. Make sure you have the pattern you want facing the right direction before you punch. The large flower die from the Bloomin' Heart Thinlits die cut the flowers that you see. Pearls made the flower centers and the bird's eye. That Big Shot Die Brush works wonders! I highly recommend it! If you are in my area, you are invited to my Technique Night classes. 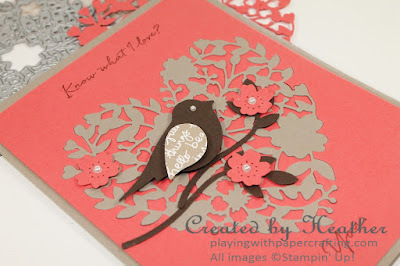 Join with a fun bunch of ladies and learn some new stampin' techniques!